Steel guitariste Country US né Roddis Franklin Drake, le 8 Août 1932 à Atlanta (Georgie). 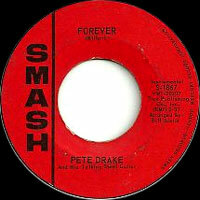 Pete Drake est décédé le 29 Juillet 1988 à Nashville (Tennessee). When rock artists, including Bob Dylan and members of the Beatles, began to record in Nashville, Pete Drake (born Franklin Drake) was the natural choice as steel guitarist. 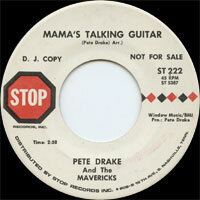 Although he had a Top 30 hit, "Talking Steel," in 1964, Drake recorded very little on his own. Instead, he used the trademark mellow tone of his steel guitar to strengthen albums by other artists. 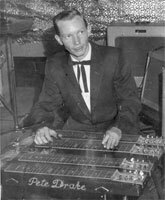 In addition to working with country artists, including Marty Robbins, Bobby Bare, Johnny Cash, the Louvin Brothers, Dolly Parton, and Ernest Tubb, he pioneered the use of the steel guitar in rock, performing on recordings by Buddy Holly, the Everly Brothers, Carl Perkins, Jerry Lee Lewis, and Elvis Presley. He played on such seminal recordings as Lynn Anderson's "(I Never Promised You A) Rose Garden," Charlie Rich's "Behind Closed Doors," and Tammy Wynette's "Stand By Your Man." Featured on Dylan's albums John Wesley Harding, Nashville Skyline, and Self Portrait, Drake also produced and assembled the band for Ringo Starr's country album, Beaucoups of Blues, and played on George Harrison's solo debut, All Things Must Pass. The son of a Pentecostal minister, Drake began his career with a group, the Drake Brothers, that he shared with his brothers, one of whom, Jack, went on to play with Ernest Tubb's Texas Troubadors for nearly a quarter of a century. Drake's melodic steel guitar playing made him one of Atlanta's top young instrumentalists. He joined with future country music superstars Jerry Reed, Doug Kershaw, Roger Miller, and Joe South in a mid-'50s band. 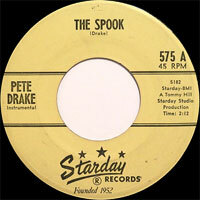 Although this group failed to record, it provided Drake with the impetus to move to Nashville in 1959. Drake's involvement with Elvis Presley, which began in May 1966 when he played on Presley's How Great Thou Art album, lasted for more than a year and included appearances on the soundtracks of Presley's films Double Trouble, Clambake, and Speedway. Launching his own record label, First Generation, in the late '70s, Drake signed Ernest Tubb, who had left MCA after 35 years, and released an album, The Legend and the Legacy, in 1977. Comprised of reworkings of Tubb's greatest hits, the album included guest appearances by Willie Nelson, Waylon Jennings, Johnny Paycheck, Charlie Daniels, Conway Twitty, Marty Robbins, Loretta Lynn, Vern Gosdin, George Jones, Merle Haggard, and Johnny Cash. Drake occasionally stepped into the spotlight, releasing solo album of pop-gospel standards, Steel Away, and a eponymously titled album that included steel guitar interpretations of Dylan and Beatles tunes.